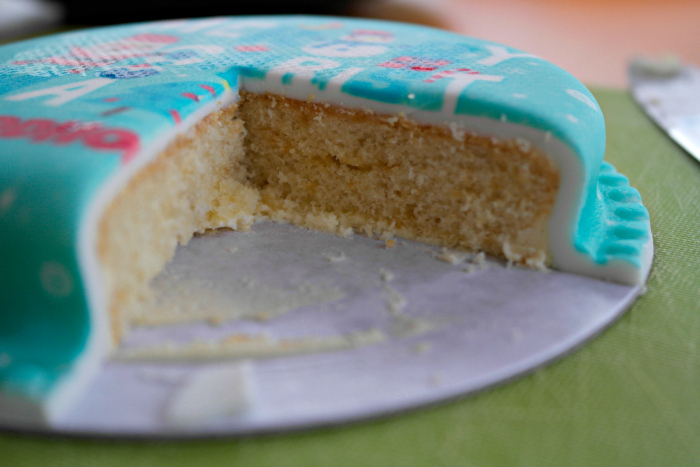 Have you ever wondered want it would be like to have a cake just appear through your letterbox? Thud, right there ready for you to enjoy! I’ve tried it – and it’s a lot of fun! It is no secret around here that I love cake. My favourite weekend activity is to go out in search of some. Since having Piglet my cake consumption has increased dramatically, mostly because I can use the excuse “the baby needs fed so we need to stop”. Cake has taken on a whole new level though, you can now get it delivered through your letterbox! 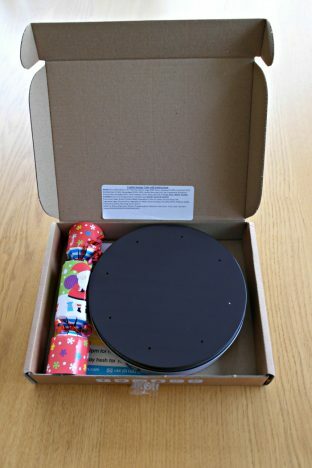 bakerdays have developed one that is 5″ diameter, which is perfect for fitting through most letterboxes. The cake arrived in a brown cardboard box. True to it’s word, it would have fit through my letterbox. I had the fun of that taken away from me as we had another package being delivered that day so the postman had to knock on the door to hand them over – boo! Inside the box, the cake itself was in a metal tin. In the run up to its arrival I had been wondering how it would be protected in the mail and I hadn’t thought of this! There was a little note telling you how to remove it from the tin, which I thought was a nice touch. We also received a mini cracker – I assume this is a fun little addition in the run up to Christmas. 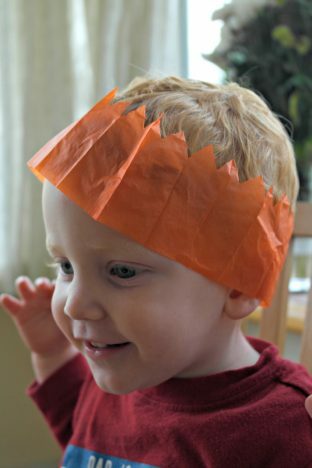 My nephews were thoroughly enjoying playing with the Christmas crown – this bodes well for Christmas day! They offer a huge array of designs, anything from birthdays to congratulations to sorry. I spent ages looking at them, and was particularly tickled by the poo emoji cake! Since it is mid November though, I opted to order a Christmas design to get us all starting to feel festive. 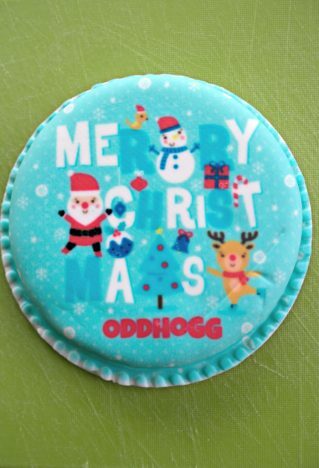 You can personalise the cakes, so the obvious choice for me was to get OddHogg add to mine! 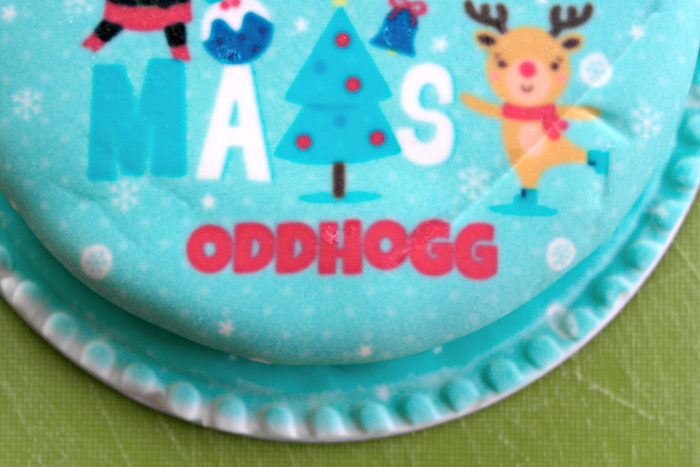 The design is printed onto the icing. It was bright and clear. Tempting as it was to sit at home and devour the entire cake myself, I opted to share this one. 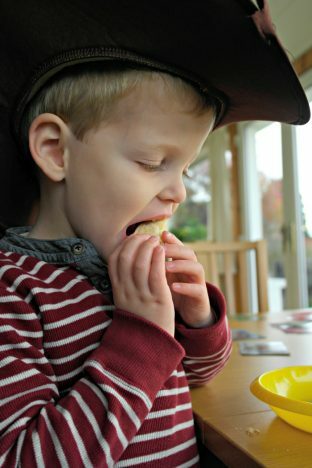 I roped in my sister and two of my nephews, because no one will ever be as brutally honest as a toddler! The little guys had zero complaints. 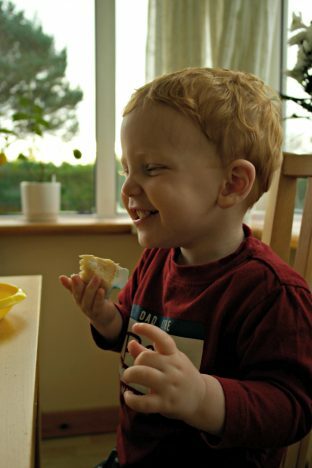 They were more than happy to discover their morning snack was a cake. My sister and I agreed that it tasted good, much like any other shop bought cake you can get. There wasn’t too much icing, as is sometimes the issue I have with this type of cake. The only complaint I have is that it is a single layer. I know this is going to be down to logistics, it would be ridiculous to try and make a 2 layer cake and still have it fit through a letterbox. But I do love the middle of a cake! We thought it was a fun, something unusual that you certainly don’t see every day. It is a great idea to order for someone for a birthday if they live in a different city, and at £14.99 it doesn’t break the bank. If you are willing to pay a bit extra you can get next day delivery – perfect for if you’ve forgotten to do it decided you wanted to order last minute. The cake is advertised as serving 3-4 but we only ate half of it in one sitting. The cake stays fresh for a few days so it certainly didn’t go to waste! It was quite sweet so a small slice was all we needed at a time. A tasty little cake, convenient and great design options. If the right occasion arises I wouldn’t hesitate to order again. 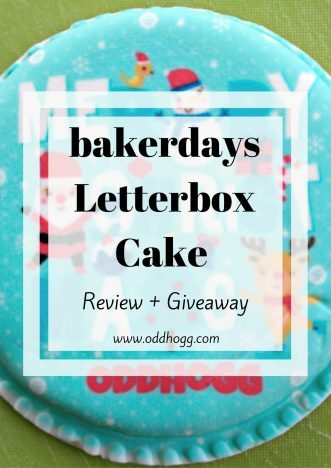 Disclaimer: We were a letterbox cake free in order to review it, however all views are my own. Haha now that would be a hilarious gift! Wow this looks awesome, I’m definitely going to enter later on. Love a good cake!!! I was skeptical about the whole post thing but it totally works! My granddaughter would love the idea of getting a cake through the post! If I was to win, I would order the cake for my mum as it’s her birthday on the 11th December! That would be a fab surprise!! My daughter she has her mock gcse’s starting this would be great as a bit of encouragement. I’m sure cake would be a welcome break from studying! I would order the cake with my partner in mind. I would order for my other half, he deserves a treat. I would order it for my daughter. This looks great! I love that you got your nephews involved to help with an honest review. Their faces say all I need to know! If they hadn’t liked it we’d have known about it – pair of monkeys! exactly – and it’s a lot more fun having it arrive at your door! I’d order if for my grandparents for a treat! I would order it for my children to share. Retirement cake for my other half. My best friend…though I would share it with her. Its a bit of a fun really, I’m sure the kids enjoyed it! It would be for my boyfriend – he does love cake! Cake through the letter box is my kind of post! Mmmmmmm! Thank you so much for being a part of the #bigpinklink it’s great to have you with us! Oooh I’ve never had flowers! Thats fancy too! For my sister in law for her birthday! For my son and daughter – what a treat! I would choose the Dog Selfie Cake for my BFF birthday! I’d order a little Xmas cake for my son who’s just reached that age when he’s beginning to realise how much fun Xmas all is. I took the last piece to my dad and he somehow stole the tin from me saying it was perfect for him! I would order for my daughter. Will order it for my in laws as a special treat. i’d order a Christmas one, so we can all share it. What a lovely Christmas design, and I really don’t think there’s anything better than receiving cake in the post! Bakerdays are great aren’t they?! Letter Box Cakes perfect if you are useless in the kitchen like me. I’d order a cake for my brother. Ooo cake being delivered right to your door is amazing! I think I might order my Nain a cake. IT would cheer her up so much! A cake for my niece. They’re not cheap – but as a one-off gift its ok. Wouldn’t want to make a habit of it though! I bet she loved that!! I’d order it for us to celebrate the first night in our new house! i would order a christmas one for all the family! My birthdays coming up so I would order one for me, to share with family. My Sisters birthday which is coming up soon. I would order a beautiful cake for my daughter who is 11 years old. I would get it for my other half he loves cake and a cuppa! I would order a cake for my Nanna because she’s been poorly lately and she has a real sweet tooth. I would order it for my daughters next birthday when she will be sweet 16! It would have to be my husband. I will just send it to myself. I would send it to my niece. It would be for my nephews birthday which is coming up soon. I’d love this for my mum 🙂 I won’t see her this Christmas so she will love this. I would order one of these gorgeous cakes for our eldest daughter to congratulate her on gaining her dream job! I would have said my two daughters who have their birthdays in december but one has been and gone last week and the other is Monday, so would have to say me. I never get a cake so I would treat myself and share it with my three daughters and fiance. I think I’d send it to myself, ha!! 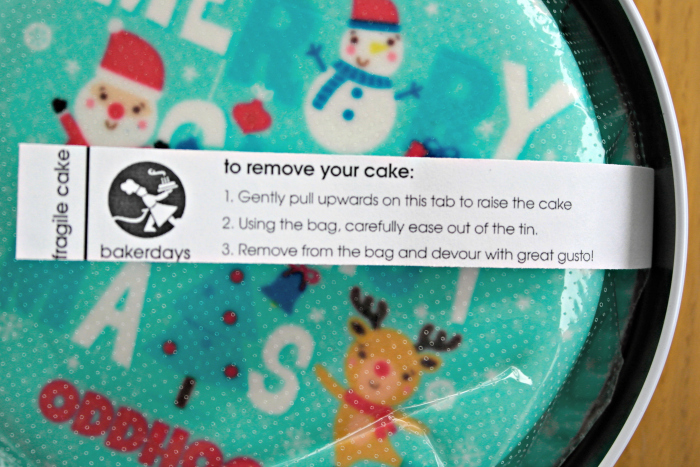 Anyone able to have it; bakerdays cakes are delicious! My children! They would love a cake through the post! My husband and daughter would love this. I’d order one for my sister who is putting us up at Christmas.